It’s cold outside here in Iceland. The light is dim and limited during the daytime. On the upside, I have actually seen sunrises during this trip and they are longer than usual, as are the sunsets. 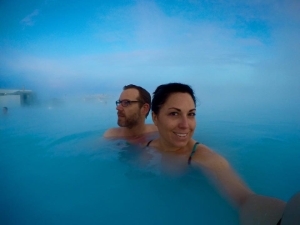 After arriving at the airport, we went directly to The Blue Lagoon – a very popular geothermic spring fed pool where you can relax, spread mud on your face, and get rid of any travel tensions. The next morning, we embarked on a two-day tour of the coastline south and east of Reykjavik. 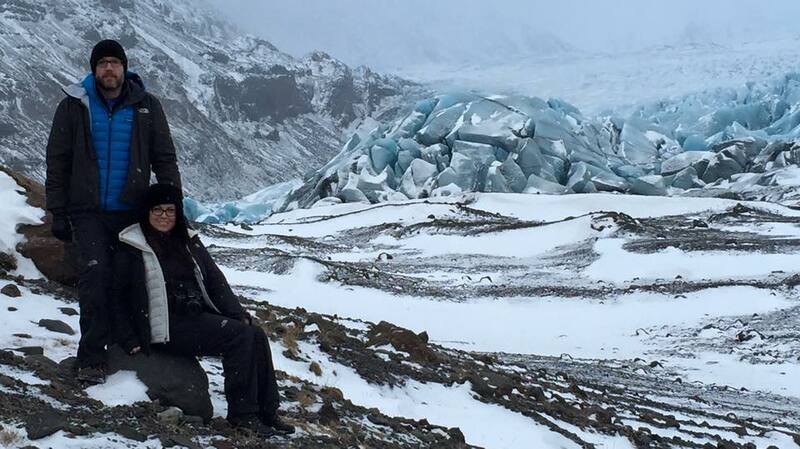 We saw waterfalls, black sand beaches with basalt column cliffs, Icelandic horses, glaciers, went ice caving and walked effortlessly on glaciers with clip on spikes for our boots, visited the glacier lagoon (see photo), and witnessed The Northern Lights (see photo). I would highly recommend the tour company Extreme Iceland – our tour guide, Bill, is a geologist and teacher and had a great sense of humor. Upon our return, we slept for what seemed like forever. I had gotten about 4 hours of sleep each night and 8 hours across 3 days just wasn’t enough. Luckily, a big storm rolled in and all of our planned activities got canceled for today. So we slept in and then went to get “healthy food”. Up until now, all of our meals have featured cakes and French fries, so it was nice to eat salad greens, beets, quinoa, and fresh baked pesto chicken. Iceland is a volcanic island, think of it as the colder version of Hawaii. Things are expensive here because most of it is imported. The cost of living is proportionately high, but the quality of life is also high. Everyone that we have met loves living here. They say that even sorting car insurance was “easy” and done over an email or two. Tomorrow, we will attempt our rescheduled Northern Lights tour with Super Jeep. 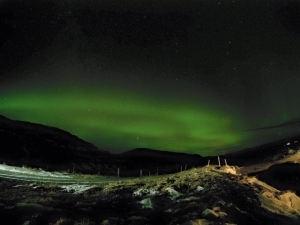 According to other tourists who have gone on this tour, we will travel to different locations to see the lights, up into the mountains, and above most of the cloud cover. Hopefully, the conditions will be good and the lights will be visible. If not, we have a few extra days buffered into our vacation. After that, we have a Golden Circle tour, expect more photos soon. Here’s a link to my public Facebook album if these photos left you wanting to see more of Iceland.